Kalida’s Halie Kaufman puts up a shot against Leipsic’s Josie Hermiller during Saturday’s Putnam County League game at Leipsic. Leipsic’s Bailee Sickmiller puts up a shot against Kalida’s Grace Klausing during Saturday’s Putnam County League game at Leipsic. Kalida’s McKayla Maag, left, and Leipsic’s Peyton Henry go to the floor for the ball during Saturday’s Putnam County League game at Leipsic. 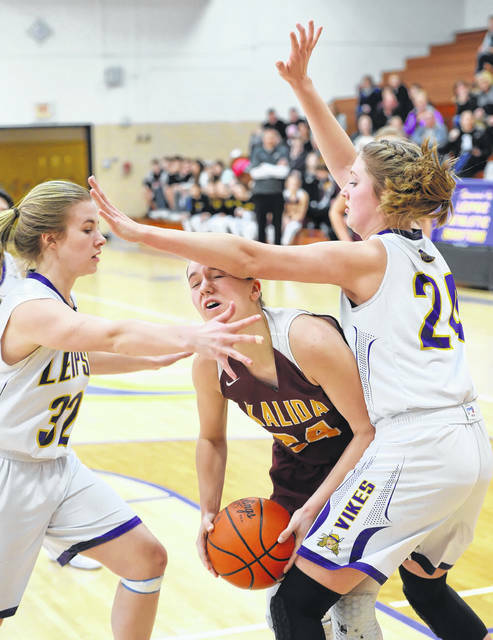 Kalida’s Abby Wurth drives between Leipsic’s Josie Hermiller, left, and Liz Scheckelhoff ball during Saturday’s Putnam County League game at Leipsic. 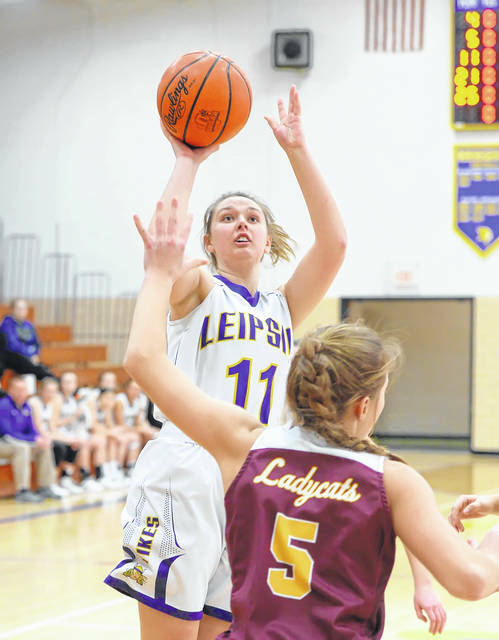 LEIPSIC — With the girls basketball tournament right around the corner, there remains a lot to be decided in the 2018-19 basketball season. Such as the Putnam County League championship. Kalida took a major step in that direction Saturday, using its stellar defense to shackle Leipsic 42-26 on Senior Day at Leipsic High School. That moves the Wildcats to 15-5, 6-0 in the PCL, with only a game versus Continental left to decide matters. Both coaches agreed that defense was the biggest key to this matchup. Leipsic head coach Gary Kreinbrink thought his team did a good job there, as well. 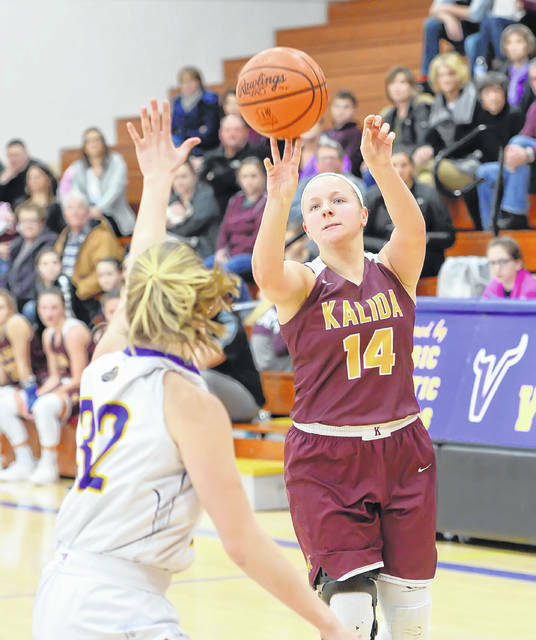 Kalida came out with an aggressive man-to-man defense, which it extended in some form or another most of the way, and that seemed to bother the Vikings (14-7, 4-3 PCL), forcing 20 turnovers (17 for the Wildcats), six in the first period. That, along with 27.3 percent shooting (9-of-33), 2-of-9 in the first period, put the Vikings behind early. When Grace Klausing hit a basket midway through the opening period, the Wildcats led the rest of the way. Knocking down 6-of-12 shots in the opening period, Kalida took a 15-6 lead on a free throw by Brenna Smith at 1:26 before a foul shot by Leipsic’s Kacey Dulle at 1:05 made it a 15-7 score after one period. The Vikings — who employed several zones to try and stymie the Wildcats — had an answer for that early in the second period. Leipsic’s Peyton Henry (team-high 12 points) scored five quick points to get her team within 16-13 at the 5:30 mark before Leipsic’s offense went awry the remainder of the half; they missed three free throws and a shot, plus had four miscues. The Wildcats scored the final seven points of the half, capped by a 3-pointer from the right corner by Halie Kaufman at 1:40, for a 23-13 halftime spread. Leipsic needed to rally in the third period but due to 4-of-12 shooting, it really couldn’t make much of a dent in the deficit. The closest they could get was at 23-16 early on before Kalida built a 31-19 lead on a basket by Abby Wurth (game-high 20 points and 10 rebounds). Liz Scheckelhoff scored inside with 25 seconds to go to make it a 31-23 scoreboard entering the fourth period. An early deuce by Henry a minute into the fourth period got the Vikings within 31-25 but they were eventually forced to come out of their zone, with Kalida beginning to milk the clock. 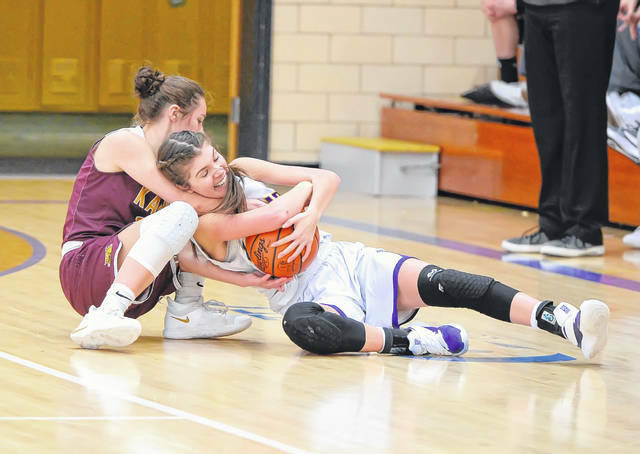 Both Scheckelhoff and Henry were injured during the fourth period — both walked off after a brief stop — and Schecklehoff eventually fouled out as the Wildcats secured at least a PCL title tie. The Wildcats finished at 38.5 percent shooting (15-of-39). Schecklehoff and fellow senior Claire Rigel led the Vikings with five rebounds each. This entry was tagged kalida, leipsic. Bookmark the permalink.